Ignace Joseph Pleyel was born in Ruppersthal on 18 June 1757. His musical future seemed assured from a very young age, studying with the composer Vanhal and then taken under the care and tuition of Haydn, leading to a lifelong friendship between the two. This tuition of the young Pleyel was paid for by Count Ladislaus Erddy. While there it would have been unthinkable that he was not influenced by Mozart, who thought highly enough of Pleyel to write of the latter"s String Quartets Op. 1 (dedicated to Count Erddy): "You will at once recognize in them his master. Fine—and it will be fortunate for music if Pleyel in his time is capable of replacing Haydn for us!" Mozart probably considered Pleyel as a rival, which says much for how well his music was regarded. Pleyel enjoyed a highly successful career travelling to Italy, London and Paris where he opened a music shop and publishing house. The latter was clearly a success as it put out about 100 editions a year for nearly 40 years, helped no doubt through Pleyel's obvious head for business. As well as this publishing venture he also founded a piano manufacturing company which continues to this day. Pleyel finally retired in 1824 and moved to a farm about 50 km outside Paris where he died in 1831. He is buried in the Pére Lachaise cemetery in Paris. Like No. 3 (HV040) Partita No. 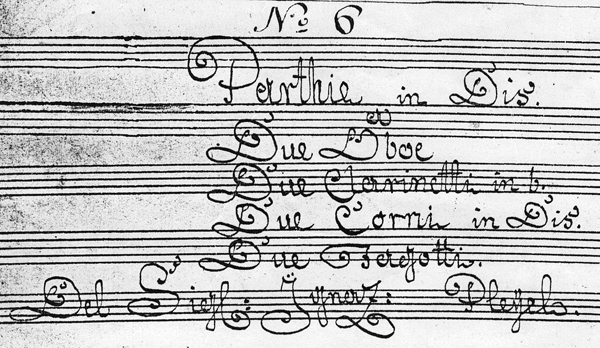 6 is not listed by Grove, only a Serenade (Partita sextet) of unknown origin. Although the front page of the edition, on which this one is based, indicates that the Partita is by a "Sig. Pleyel" we must treat the provenance of this Partita with caution.